"Look for the next round of debate to center on what Americans are willing to pay and do to stave off the worst of global warming. So far the answer seems to be, not much. The NEWSWEEK Poll finds less than half in favor of requiring high-mileage cars or energy-efficient appliances and buildings. No amount of white papers, reports and studies is likely to change that. If anything can, it will be the climate itself. This summer, Texas was hit by exactly the kind of downpours and flooding expected in a greenhouse world, and Las Vegas and other cities broiled in record triple-digit temperatures. Just last week the most accurate study to date concluded that the length of heat waves in Europe has doubled, and their frequency nearly tripled, in the past century. The frequency of Atlantic hurricanes has already doubled in the last century. Snowpack whose water is crucial to both cities and farms is diminishing. It's enough to make you wish that climate change were a hoax, rather than the reality it is. With Eve Conant, Sam Stein and Eleanor Clift in Washington and Matthew Philips in New York"
Newsweek Magazine’s cover story of August 6, 2007 entitled, “The Truth About Denial” contains very little that could actually be considered balanced, objective or fair by journalistic standards. 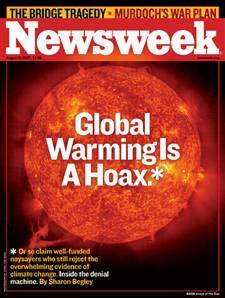 This week’s “news article” in Newsweek follows the Magazine’s October 23, 2006 article which admitted the error of their ways in the 1970’s when they predicted dire global cooling. (See: Senator Inhofe Credited For Prompting Newsweek Admission of Error on 70's Predictions of Coming Ice Age) In April, 1975, in an issue mostly taken up with stories about the collapse of the American-backed government of South Vietnam, NEWSWEEK published a small back-page article about a very different kind of disaster. Citing "ominous signs that the earth's weather patterns have begun to change dramatically," the magazine warned of an impending "drastic decline in food production." Political disruptions stemming from food shortages could affect "just about every nation on earth." Scientists urged governments to consider emergency action to head off the terrible threat of . . . well, if you had been following the climate-change debates at the time, you'd have known that the threat was: global cooling. AND - on it Goes! Unlike those '$elling Doom' - and then Ca$hing their Carbon Refund Check$.